This article is about the series featured in Yu-Gi-Oh! R. For the archetype known colloquially as the Wicked Gods in the Japanese version of Yu-Gi-Oh! 5D's, see Earthbound Immortal. 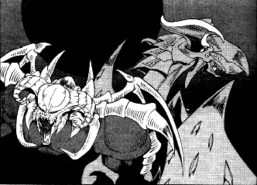 The Wicked Gods, also known as either the Evil Gods or Jashin in the English VIZ translation, are a series of Level 10 DARK Fiend monsters who were originally featured in the Yu-Gi-Oh! R manga; these cards formed the dark counterparts of the Egyptian God Cards. In Yu-Gi-Oh! R, these cards are revealed to have been designed by Maximillion J. Pegasus in secret some time after creating the God cards. He made the rudimentary designs for the three cards in an attempt to keep the Egyptian Gods in check, but feared their immense power, and never completed their production. The Wicked Gods, like their Egyptian God counterparts, were never released to the public. Yako Tenma later completed the cards based on what Pegasus left behind, and named them the "Wicked Gods", and used them to enact revenge on Yugi Mutou for the death of Pegasus. Once he touched "The Wicked Avatar", the card possessed him, damaging his mind and giving him a need for revenge. Yako spent some time 'testing' the cards, including his first Duel against Yugi. He also possessed his brother, Gekko Tenma, to test "The Wicked Dreadroot". Tenma revived Keith Howard and presented him with "The Wicked Eraser" to use in his Deck. He used both "The Wicked Avatar" and "The Wicked Dreadroot" at the same time against Seto Kaiba. During his final battle against Yugi, Yako used both "The Wicked Eraser," and "The Wicked Avatar," in quick succession. The Wicked God cards seem to be exceptionally powerful, stated by Yako to have been created solely to keep the Egyptian God cards in line. The Gods seemed to be able to revive the dead, since Yako was able to revive Keith Howard using the cards. The three Wicked Gods were in fact primarily used in Yako's attempt to revive Pegasus. By linking Anzu Mazaki to the Gods, and using "The Wicked Avatar" as a medium, Yako revived Pegasus' spirit. This plan ultimately failed when Yugi destroyed the "Avatar" using an enhanced "Obelisk The Progenitor". In addition to "Avatar" possessing Yako, it allowed Yako to possess others, such as his brother, Gekko. Unlike the Egyptian God cards, the Wicked Gods were at least produced in duplicates, as both Gekko and Yako possessed one copy of "The Wicked Dreadroot" each, while Keith and Yako both possessed one copy of "The Wicked Eraser" each; this makes "The Wicked Avatar" the only Wicked God to be unique, specifically to Yako. After Gekko's defeat, he tore up his Wicked God, and after Yako lost, he tore up his. As such, presumably only Keith still has his Wicked God card. However, Keith constantly complains about how the Wicked Eraser doesn't go with his Machine cards and heavily implies that he only uses them because Yako has forced him to. These cards share the Hierarchy System with their counterparts (e.g., among the Egyptian Gods "Obelisk the Tormentor" and "Slifer the Sky Dragon" were Hierarchy 1, while "The Winged Dragon of Ra" was Hierarchy 2), with "The Wicked Avatar" higher than the other two. It is also known that they share the remainder of the Divine traits with the Egyptian Gods. Like the hierarchy of the Egyptian Gods in the manga, the Wicked Avatar (who is at the top) cannot be destroyed by the other two gods, as well as being invincible against "Obelisk" and "Slifer". The Wicked Dreadroot - A counterpart of "Obelisk the Tormentor". He looks human shaped with wings like Obelisk and the same ATK and DEF as "Obelisk" too. His effects are also the reverse of that of "Obelisk". The effect of "Obelisk" that Tributes the controller's own monsters to destroy the opponents, while the effect of "Dreadroot" affects all other monsters and instead lowers their ATK. The Wicked Eraser - A counterpart of "Slifer the Sky Dragon". He looks like a twin-mouthed dragon, just like "Slifer" (in the manga, both appear to have no hind limbs). He also has effects that are the reverse of that of "Slifer", while "Slifer" gains points for every card in its controller's hand, "Eraser," gains points for every card on the opponent's field (a trait which leads Seto Kaiba to insult it in the manga). Also, the destruction effect of "Slifer" activates only when another monster is added to (the opponent's side of) to the field, and only targets a single monster, whereas the destruction effect of "Eraser" activates when its own self is destroyed and destroys all cards on the field. The Wicked Avatar - A counterpart of "The Winged Dragon of Ra". He looks like "The Winged Dragon of Ra - Sphere Mode". The effect of "Avatar" is the reverse of the effect of "Ra", which has several effects to gain ATK, while "Avatar" only has one, where the ATK of this card was only one point higher than the strongest monster, and "Ra" used all but one of your Life Points for its effect, as well as gaining ATK by sacrificing monsters (including its Tributes) in the anime and manga (both were changed to 100 for the TCG/OCG). In other words, "Ra" needs monsters and Life Points sacrificed to be stronger, whereas "Avatar" needs monsters alive to be stronger. One key difference that must be noted, however, is that these are intended as the opposites of the "Egyptian God" cards. Hence, while both are DIVINE-Attribute in the manga, the kanji is placed against the LIGHT-Attribute symbol for the "Egyptian Gods", but against the DARK-Attribute coloration for the "Wicked Gods". When they were released in the TCG/OCG, no DIVINE or Divine-Beast monsters had been released, so they were made DARK/Fiend. Unlike the "Egyptian Gods" or "Sacred Beasts", the "Wicked Gods" do not have a fourth, combined member. The "Wicked Gods" themselves possess high-unstoppable effects that can easily turn the game in your favor, but they are considerably harder to get out than their "Sacred Beasts" counterparts. While each God does have rather simpler summoning requirements, they are not special summons. They also require 3 tributes each and cannot be used with "Mausoleum of the Emperor". Thus, monsters who survive battles, ones with high DEF, or those who you can special summon/summon multiple copies of in a single turn should be used, or monsters that can not be destroyed by battle. The Wicked Gods themselves lack Spell and Trap protection, thus are quite a bit more vulnerable when used against an opponent who uses a lot of monster removal. "March of the Monarchs" and "Mound of the Bound Creator" can help. "The Wicked Eraser" is designed to punish the opponent for swarming and setting cards, gaining ATK for each card under their control, and wiping the field if it's destroyed.